A chic holiday Pedi, right? We have picked 5 stunning red shades to create easy nail art for the Christmas and New Year season. I truly mean, one can never go wrong with a classic red nail polish throughout the year, especially during holidays. These are all in an amazing bold red colored jewel tone, sparkly, glittery, and as rich red as Rudolph’s nose. So you’re all set to look gorgeous for the cocktail parties. This year while you buy Christmas gifts for your loved one, grab some gorgeous nail polish for Nail Art. 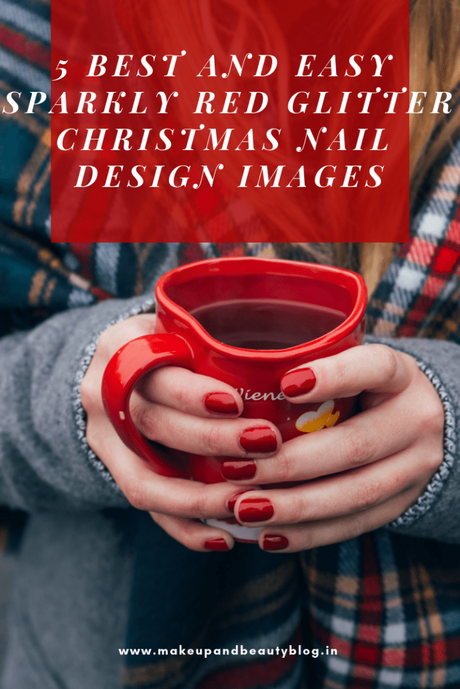 Check the below nail art pics for this Christmas and holidays. 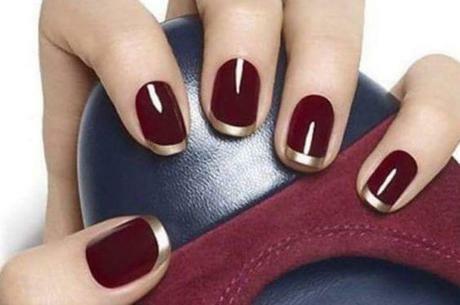 Paint your nails with 2 coats of this dark red polish. Dip a thin striper brush in white polish & start drawing a thin vertical line. Then draw a horizontal and diagonal line over it to make a star. Now using a pointy stick dipped add some white polka dots near the star and finish with clear topcoat. Red isn’t an unconventional nail paint color for the Christmas and holidays. This one has an inspiration from the night sky during winter and twinkling stars. Just Paint 2 coats of a deep red polish. Use a thin striper brush and dip in gorgeous gold metallic nail polish. Now start painting a small line from one side to another of the nail edge. Finish these nail designs with glossy topcoat. This nail polish design a subtle shine resembles the glistening snow at night and make your nails look super stunning. Start by painting your nails with two coats of a dark red polish. Layer a topcoat and instantly sprinkle on some golden glitter before your top coat dries. Dust off the remaining glitter with the use of a tiny brush to dust off the glitter. Paint a top coat for a perfectly shiny finish. And if creating nail designs aren’t your thing, here’s a shimmery, gold-meets-red hue with glitters. 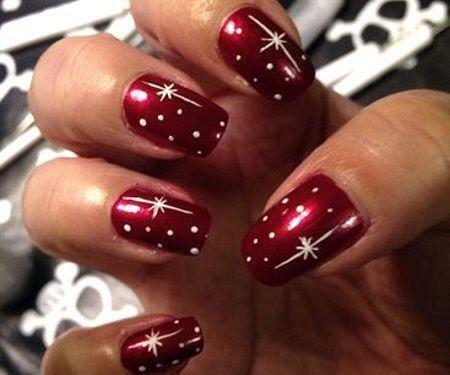 Your nails are sure to look exactly like those sparkling Christmas lights all around. Are you a metallic lover? Go trendy this season with brilliant silver shade paint with hints of red to remind you of tree’s tinsel. Apply 2 coats of silver nail paint on your toenails. Make a half moon a quarter inch up from the cuticle and paint it with the red hue. Finish it with a matte topcoat only on the red part to get semi shiny festive finish. 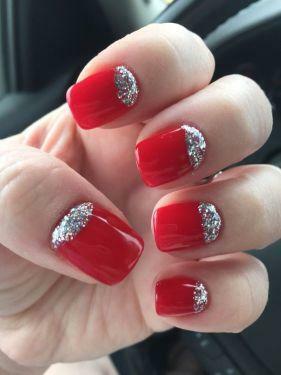 Switch to usual shimmery and glittery polishes with a matte finish, just like this stunning red color. In addition, so literal color schemes is a great idea for the holiday vibes and cozy winter season. Chic emerald shade is as classic as Christmas color red. 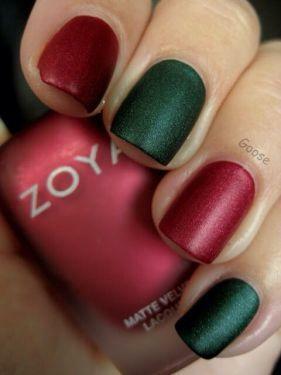 Just paint your alternate nails with pretty glittery polish red and green to look holiday-ready. Buy nail art kit for more precise design, finish and fun nail arts. 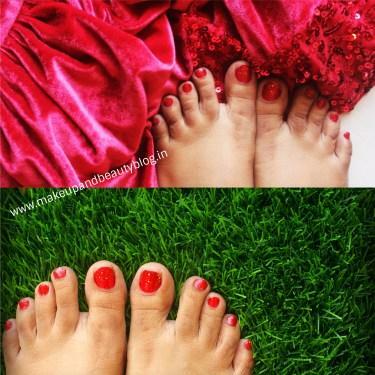 Let us know your favorite for 5 Best and Easy Sparkly Red Glitter Christmas Toe Nail Design Images!! !